Bodog is historically the most accommodating Mac casino in terms of flashed based gaming software. Bodog Casino has made a point to give their many Mac-using members the quickest access to a wide variety of compatible casino games, including Mac Roulette, Blackjack, Baccarat, Sic Bo, Video Poker, a hoard of Classic Reels and Video Slots and much more. It’s nothing less than should be expected from one of the founding fathers of the online gambling industry. 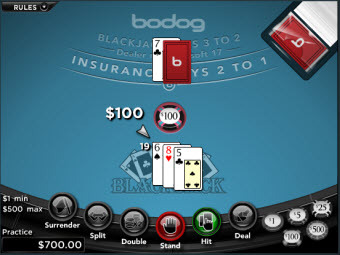 Bodog has been around since 1994, and has been extensively committed to the acceptance of US players, making up the majority of its overall traffic. The Bodog company even changed hands, and domain names, more than once to ensure its USA customer base would not be cut off from accessing the online casino, poker room and sports betting operation. If that’s not player customer dedication, I don’t know what is! For all new players, your first deposit is padded with an unlimited 10% welcome bonus. Bodog Casino does not yet offer a Mac-friendly download version of its casino, but the flash-powered software that Bodog offers is impeccable. Developed by RealTime Gaming (RTG), the graphics are as good as you’ll come by in a Java program. 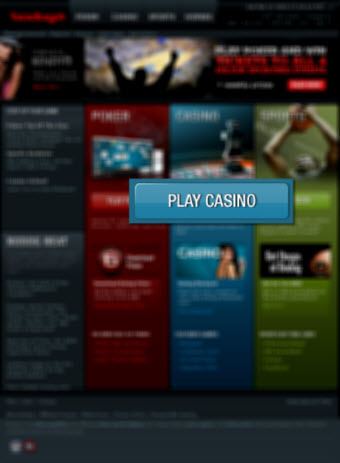 Clarity isn’t the only quality in Bodog Casino’s Mac-compatible instant-play software. The ease of navigation and game play is unsurpassed. All buttons are clearly marked and you can get instant help with anything you are uncertain about by clicking the HELP button in the top left corner. 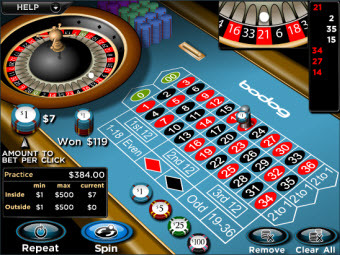 Bodog’s Mac Roulette games include American Roulette, European Roulette and a new version called Roulette PRO. European Roulette, as you probably know, has only a single zero (0) on the table and wheel, as opposed to the American version with a zero (0) and double-zero (00). The minimum bet in American and European Mac Roulette games is $1, maximum $500 per spin. Mac Roulette Pro is designed for advanced roulette players, offering a “Favorite” bet for those who often bet on the same numbers or groups. You can mix it up on one bet, then click Favorite to instantly bet your favorite numbers/groups. There’s also an auto-spin option to keep the wheel spinning on the same numbers/groups for a specified amount of spins. Roulette PRO even offers statistics on the numbers, colors and odds/evens that come up most often and least often. The minimum wager on Roulette Pro is $1, maximum $300. 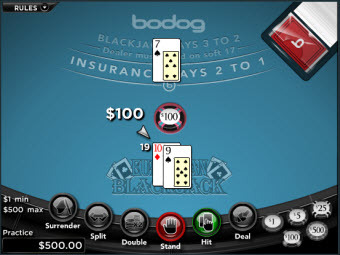 When you first join Bodog Casino, you’ll get an instant 10% bonus on your first deposit. This is an unlimited bonus, so if 10% doesn’t seem like much, it can actually be extremely high depending on how much you choose to deposit on the initial purchase. The only limitation, if any, would be that of the payment method you use. Bodog Casino gives all real money players comp points each time they place a wager. It doesn’t matter if you win or lose a bet, the comps are still awarded, and can be converted to real cash once you have enough points in your account. Referring your friends to Bodog Casino is worth $100 per friend. Note that Bodog pays all cashouts via Courier Check. Bodog Casino has an excellent support team. Email responses are reliable and often received within 20 minutes. Live chat support is open 24/7. For members who reside in North America, there are toll-free telephone lines also open 24/7.